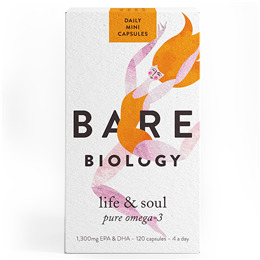 Bare Biology Lion Heart Capsules are teeny, tiny capsules of pure and unadulterd fish oil, with 1300mg EPA and DHA per serving. If you`re going to take omega 3, take it in its purest, most powerful form. The well documented benefits of omega 3 are dependent on consuming effective amounts of EPA and DHA, the essential fatty acids found in oily fish. Four tiny capules a day provide an excellent level of EPA and DHA, equivalent to more than a whole tin of sardines, in the natural triglyceride form, keeping your body in tip-top shape. Every single batch is independently certified by the International Fish Oil Standards (IFOS) using the strictest purity and quality criteria, giving you a guarantee that these capsules are pure and powerful as they contain no heavy metals or other contaminants. Extra high concentration of EPA (860mg) and DHA (440mg) with 1460mg omega 3 per dose of 4 tiny capsules. Fish gelatin capsules, never pork or beef. Contributes to cardiovascular, brain and visual health. Natural triglyceride form for optimum absorbency. Each batch is independently certified and awarded a 5 star rating for purity, freshness and strength by the International Fish Oil Standards (IFOS). Fully published certificates of analysis for every batch. Always sustainably and responsibly fished. Made from wild sardine, anchovy and mackerel from clean waters. With the highest amounts of omega 3 on the market and certified purity and freshness, Bare Biology supplements get you quick results. Feel better faster with fish oils that work. Fish oil (from sardine, anchovy and mackerel), fish gelatin, glycerol BP (British Pharmacopoeia), Vitamin E (tocopherol). Adults and children over 12 take 4 capsules daily. Suitable for pregnant and breastfeeding women. Do not use if product safety seal is broken or missing. Store in a cool place with the lid firmly closed. Consult your doctor before taking if you have any medical condition or are on medication (especially blood thinners). Below are reviews of Bare Biology Lion Heart Omega 3 Fish Oil - 120 Capsules by bodykind customers. If you have tried this product we'd love to hear what you think so please leave a review. 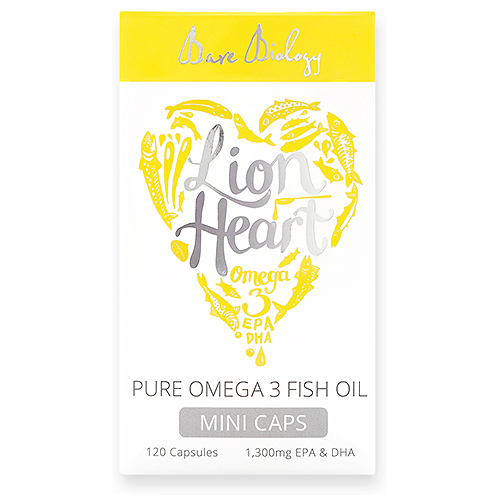 Bare Biology Lion Heart Capsules are teeny, tiny capsules of pure and unadulterated fish oil, with 1300mg EPA and DHA per serving. If you`re going to take omega 3, take it in its purest, most powerful form.